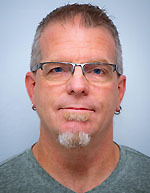 Posted on November 18, 2018 by Eric Bonnici wrote in Entertainment News. It has 0 Comment. By all accounts, the “Rockin’ For Kaleb’s Kourage” fundraiser at Rockstar Music Hall on Friday November 16 was a booming success! The near capacity crowd of supporters and family were there to lend support to the family and pay tribute to and honor Kaleb Houle, the courageous young man who tragically succumbed to his third battle against cancer at the tender age of 13 just barely a week before. 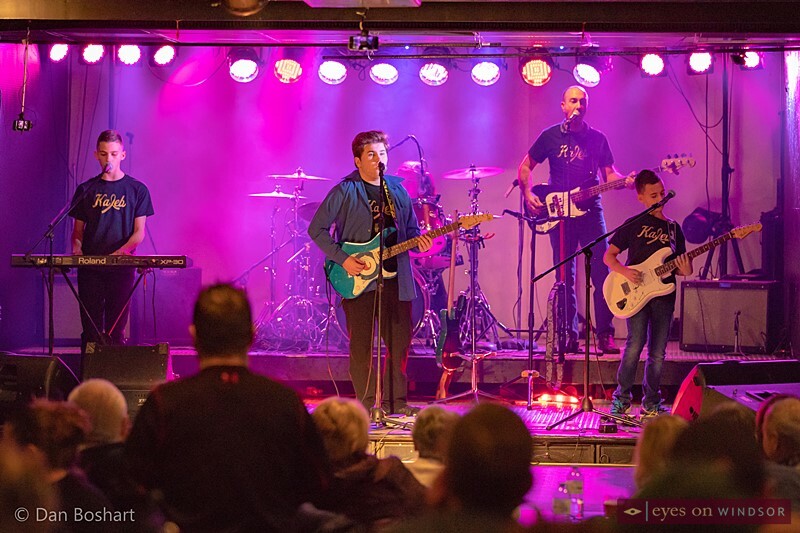 The concert was presented by Liuna 625 with support from David Hunter of the Drive Magazine. 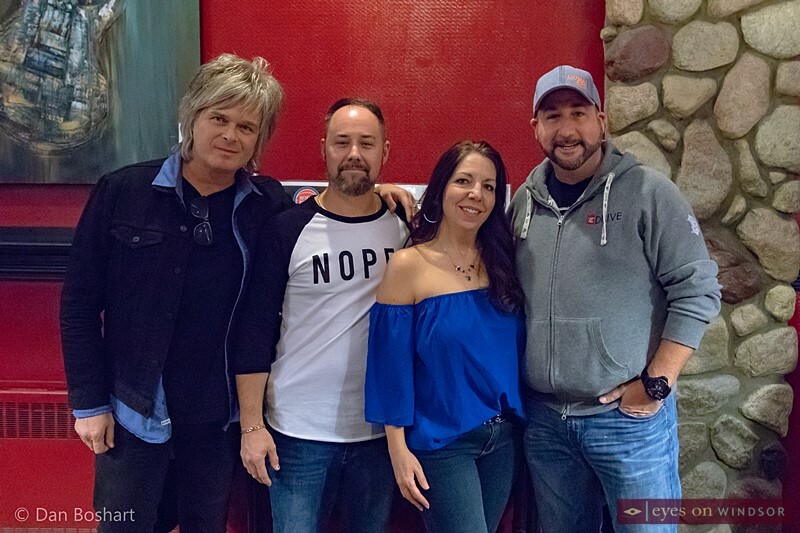 Jeff Burrows (left), Devin Houle, Jennifer Houle, and David Hunter at Rockstar Music Hall in Windsor, Ontario, during the Rockin’ For Kaleb’s Kourage concert fundraiser for the Houle Family in honour of 13 year old Kaleb Houle who lost his 3rd battle with cancer over the past four years. 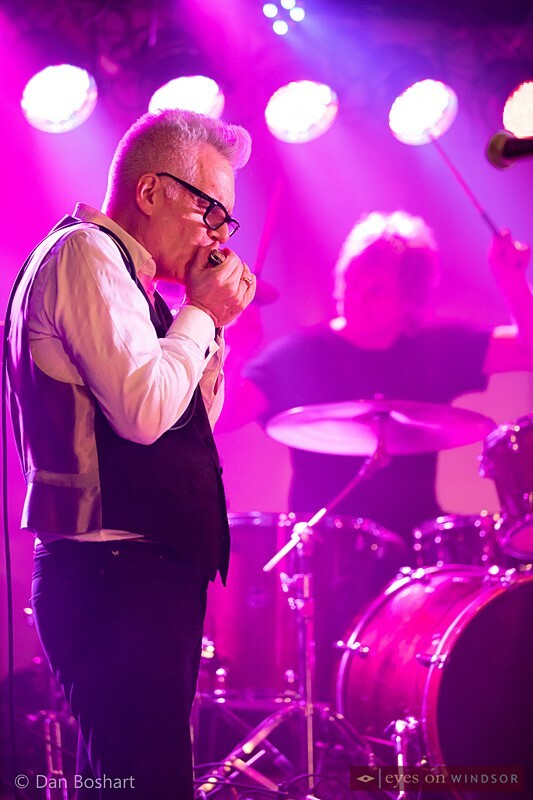 The concert took place on Nov 16, 2018. Photo by Dan Boshart / Eyes On Windsor. There were many friends and family members in attendance as well as many people who had heard about Kaleb’s fight on social media or through the local news media. Attendees were treated to some great music from local bands including Leave Those Kids Alone, The Van Lares, Madeline Doornaert, Disaster Strike, The Formula, The Family Soul and closing the night, ITABITH (Is The A Band In The House), featuring fundraiser organizer Jeff Burrows and former Big Sugar member Kelly Hoppe. Local musician Justin James Jewell, himself a recent cancer survivor, approached Jeff Burrows last minute about participating in the fundraiser and was given a slot to perform a few songs. 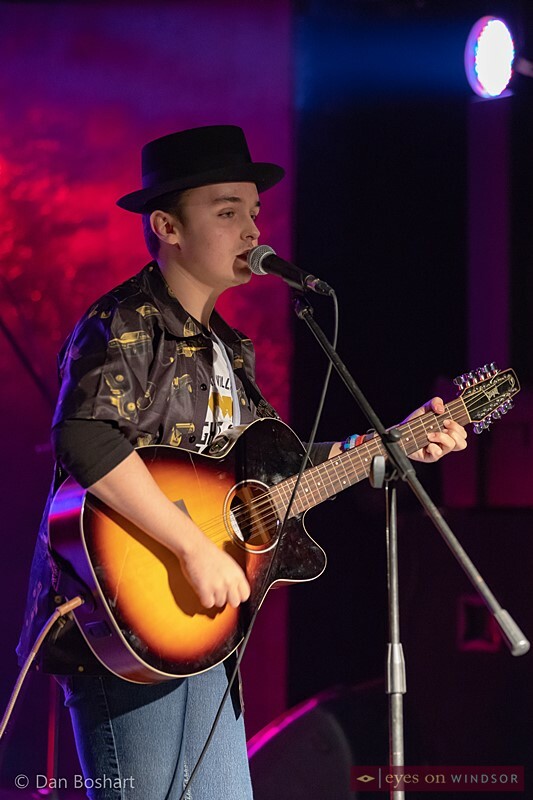 Justin James Jewell performing at Rockstar Music Hall in Windsor, Ontario, during the Rockin’ For Kaleb’s Kourage concert fundraiser on Nov 16, 2018. Photo by Dan Boshart / Eyes On Windsor. There were tables full of donated items for auction including sports tickets, original artworks, a wine fridge with a retail value of $1000.00 and maybe the most interesting item, an acoustic guitar signed by artists from the 2018 International Bluesfest Windsor. 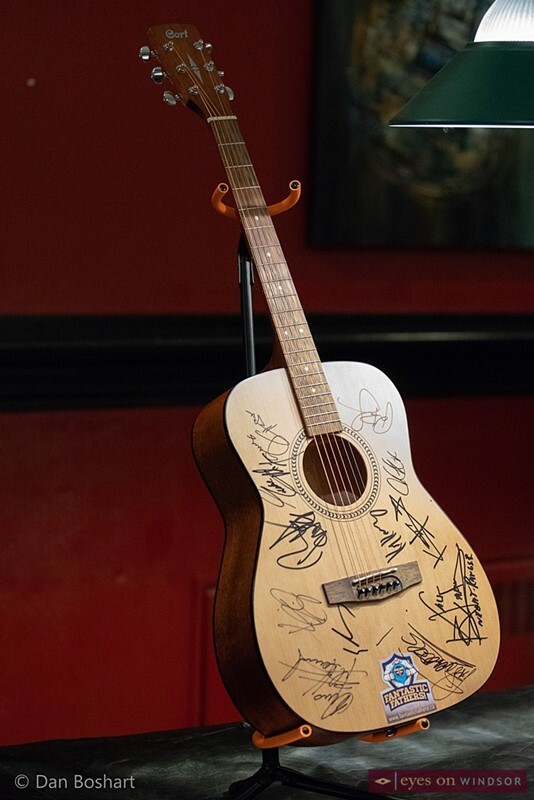 Guitar autographed by acts that performed during the 2018 edition of Bluesfest Windsor was one of the silent auction items at the Rockin’ For Kaleb’s Kourage concert fundraiser held at Rockstar Music Hall on Nov 16, 2018. Photo by Dan Boshart / Eyes On Windsor. Although this fundraiser was originally organized while Kaleb was battling his cancer, as was noted earlier, Kaleb unfortunately lost his battle on November 10. The fundraiser Kaleb’s Kourage is continuing until December 22 to help cover the medical and travel costs incurred by the family during this ordeal. If you would like to help in any way you can, please donate through “Kaleb’s Kourage” fundraiser on Facebook. Support has been outstanding but there is still a way to go to meet the goal so any help is greatly appreciated. 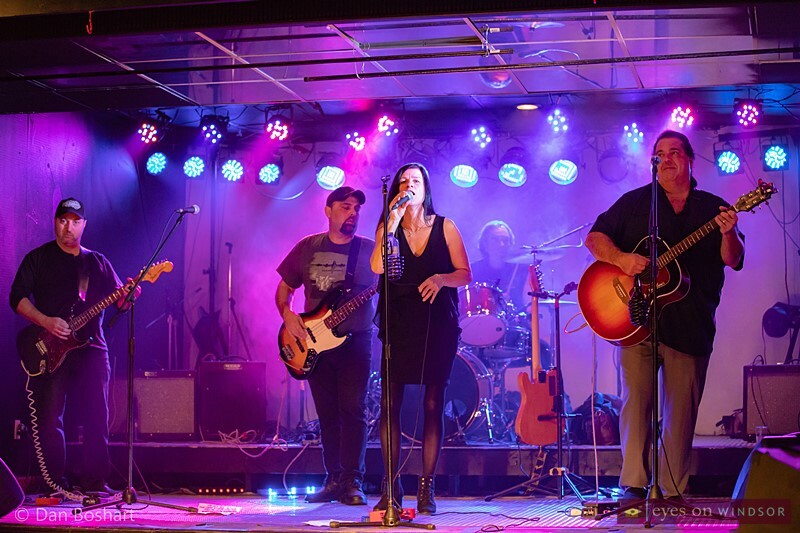 The Van Lares performing at Rockstar Music Hall in Windsor, Ontario, during the Rockin’ For Kaleb’s Kourage concert fundraiser on Nov 16, 2018. Photo by Dan Boshart / Eyes On Windsor. 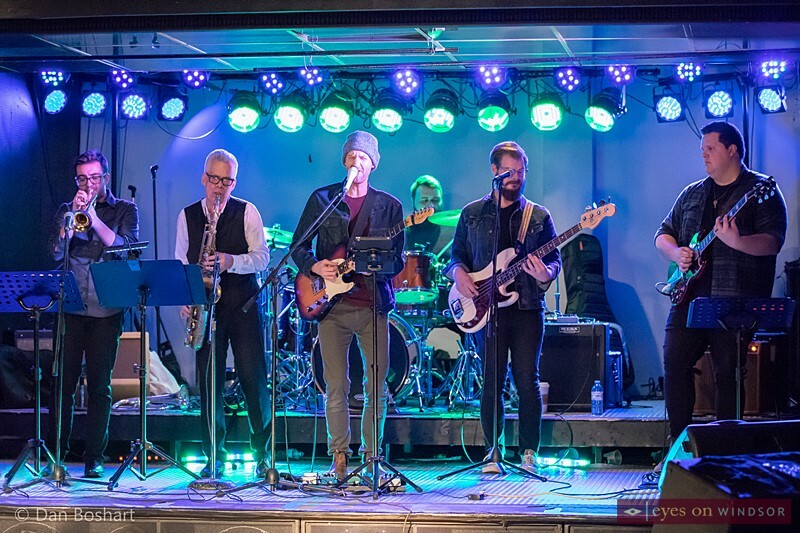 The Family Soul performing at Rockstar Music Hall in Windsor, Ontario, during the Rockin’ For Kaleb’s Kourage concert fundraiser on Nov 16, 2018. Photo by Dan Boshart / Eyes On Windsor. 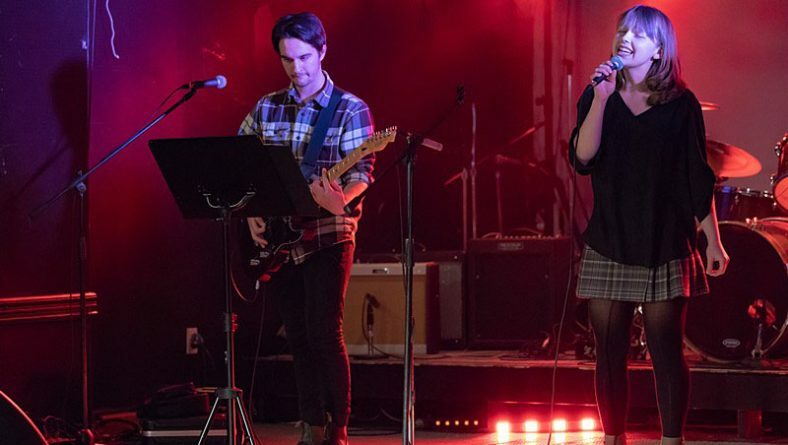 The Formula performing at Rockstar Music Hall in Windsor, Ontario, during the Rockin’ For Kaleb’s Kourage concert fundraiser on Nov 16, 2018. Photo by Dan Boshart / Eyes On Windsor. Leave Those Kids Alone performing at Rockstar Music Hall in Windsor, Ontario, during the Rockin’ For Kaleb’s Kourage concert fundraiser on Nov 16, 2018. Photo by Dan Boshart / Eyes On Windsor. 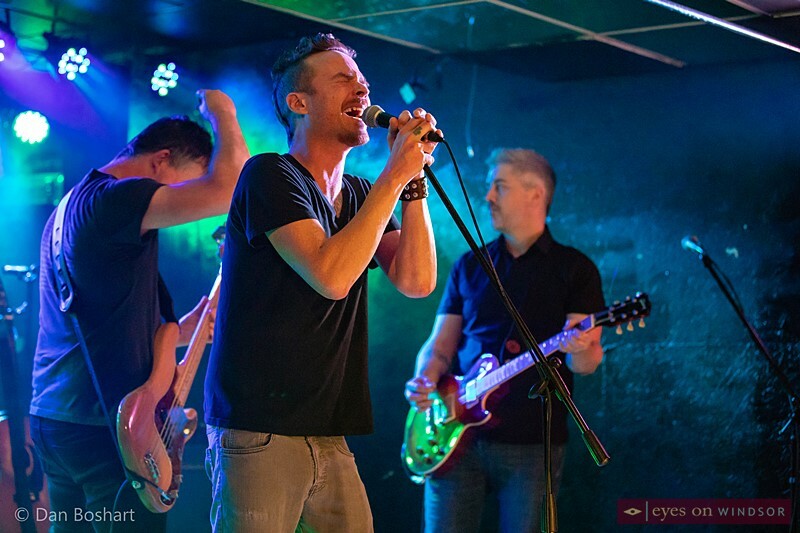 Kelly Hoppe performing at Rockstar Music Hall in Windsor, Ontario, during the Rockin’ For Kaleb’s Kourage concert fundraiser on Nov 16, 2018. Photo by Dan Boshart / Eyes On Windsor. 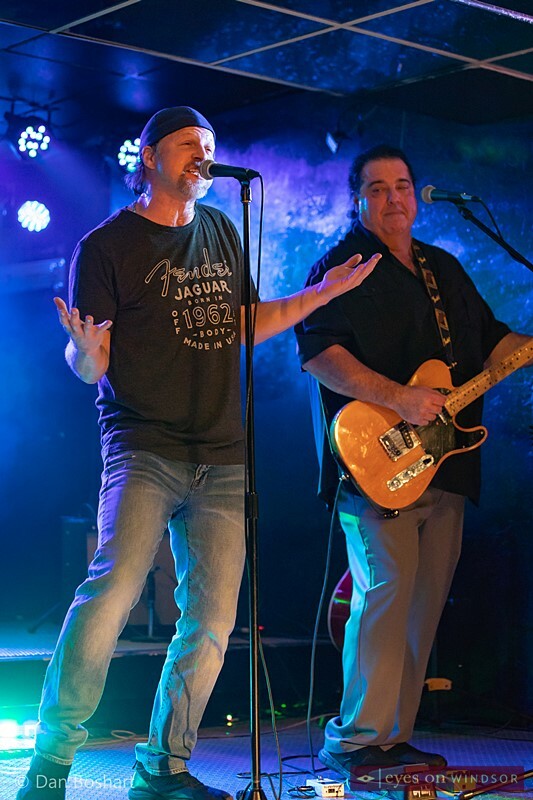 Daren Dobsky performing at Rockstar Music Hall in Windsor, Ontario, during the Rockin’ For Kaleb’s Kourage concert fundraiser on Nov 16, 2018. Photo by Dan Boshart / Eyes On Windsor. 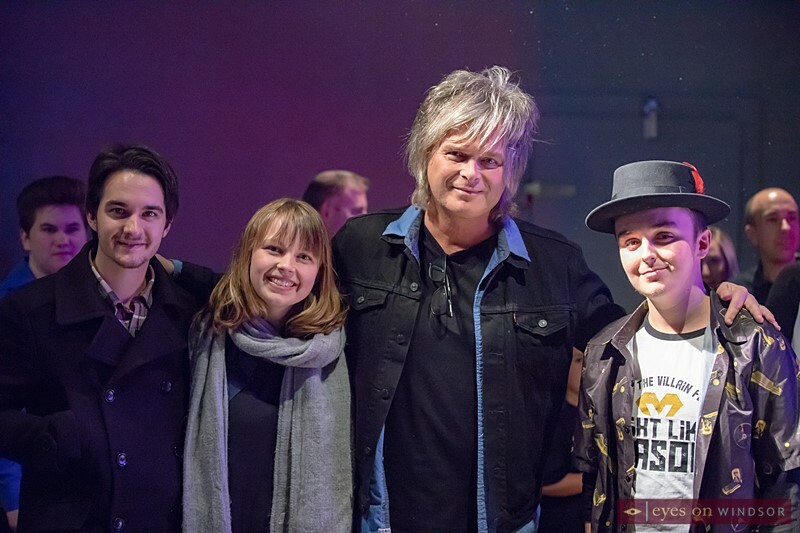 Dane Roberts (left), Madeline Doornaert, Jeff Burrows, and Justin James Jewell at Rockstar Music Hall in Windsor, Ontario, during the Rockin’ For Kaleb’s Kourage concert fundraiser on Nov 16, 2018. Photo by Dan Boshart / Eyes On Windsor. 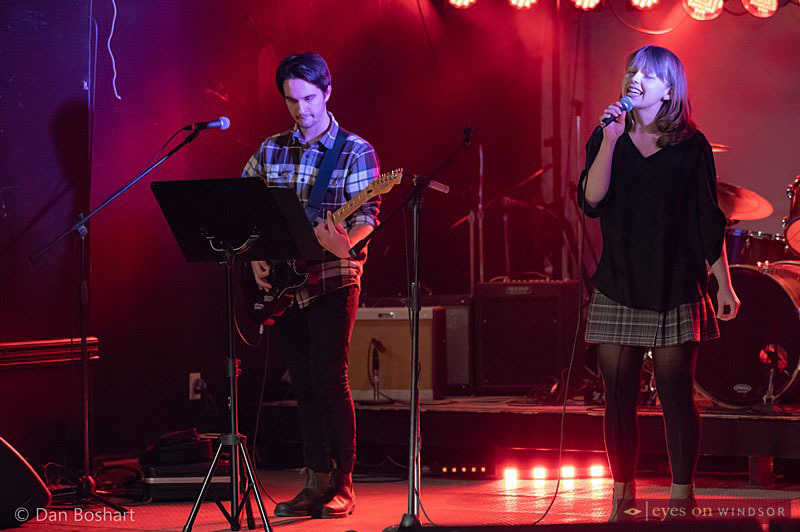 For the complete photo gallery of this concert please visit the set we posted on the Eyes On Windsor Facebook Page.